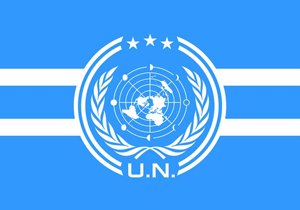 The United Nations (UN) is a sovereign federation of formerly-independent nation-states that spans across several territories within the Sol system and Milky Way galaxy. Earth, or Terra as it is known by many residents of the galaxy is the originator of the Human species and one of the more advanced factions that currently vie for power within the Solar System. Along with Mars, Terra is considered one of the two economic superpowers within the system. It is capable of building large battlecruisers and fleets, producing the best medicine in the system and projecting its power over many of the stations within the belt. Terra and Luna is controlled by the United Nations. As a whole, it operates under the Security Council, a collection of representatives from the dozens of nations that had once made up the rest of the earth. They work together under the direct authority of the UN Secretariat acting as the chief executive branch. Earth is ostensibly one of the nicest places to live in the system. Many on the surface enjoy a rich lifestyle and there are those on Mars and in the belt that think of the people as Terra as weak and soft due to this. Despite this fact, however, the truth of the matter is far different. Though there are those on Earth who live like Kings, the planet itself suffers from incredibly high unemployment and those who do not have work often live in squalor. Conditions for some of the thirty billion residents of Earth can be as terrifying as those of the Belt. The United Nations System is composed of the following. For United Nations Staff positions, please review United Nations Staff.